Our catering services are custom tailored to fit our clients needs. We offer many different options depending on the type of food service that is desired. Catering is available seven days a week with advance notice. We prefer to customize your food needs with ala carte catering lists or our buffet options sheet instead of pre made menus. We are able to provide greater variety this way for our repeat customers. Prices are included on the lists so when you make your selections you will know what the charge will be or we can give you a custom bid which could also include staff, dishes, or delivery. Menu planning assistance is always available free of charge. All of our food is made in our kitchen at Settlers Inn. We use high quality ingredients with no preservatives or artificial flavorings. We have many healthy alternatives for your dietary needs plus vegetarian items. We have a full liquor license with experienced bartenders. PERSONAL CATERING: We have extensive experience with graduations and family reunions, birthday and anniversary parties, bridal and baby showers, wedding rehearsals and indoor weddings. 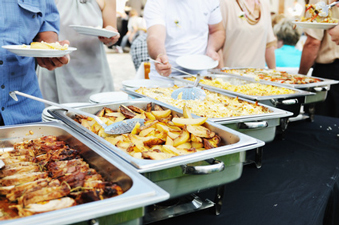 Ala carte: Let Settlers Inn make your event easier and more enjoyable for you. We can prepare one item or provide the entire meal. Make your selections off the ala carte catering lists. We would be happy to assist you in menu planning. Items can be picked up in our deli or delivery and set up is available for larger events. Full service: Let us handle the entire event including food, beverage, staff, and dishes. We can cater off site at a location of your choosing or rent our dining room at Settlers Inn. Refer to the buffet options sheet. EMERGENCY CATERING: We realize there are times in people’s lives that require food service where the customary advance notice is impossible. Funeral receptions: We will make every effort to provide food for your family and friends at the church or other location. Illness or accident: Gifts of food are always appreciated at this time. Many items are available in our deli for pick up on a daily basis. Delivery to the person’s home is available for people ordering from out of the area. ©2015 Settlers Inn. All rights reserved.